Sheriff Lacey Perman took office in Campbell County on August 12, 2004. He began his law enforcement career in 1995 as a police officer for the Mobridge Police Department and in March 2003 became a deputy with the Campbell County Sheriff’s Office. 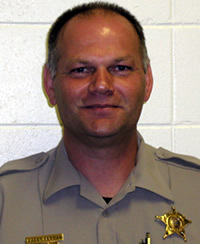 Sheriff Perman is a member of the South Dakota Sheriffs’ Association and Lodge 18 of the Fraternal Order of Police. Campbell County is 771 square miles and the sheriff’s office provides law enforcement serves for all 1,466 citizens.